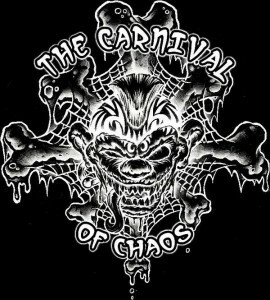 As a metal fan growing up in Michigan, there was always one festival I wanted to attend even before Mayhem Festival – The Carnival of Chaos. Founded in 2005 as a small festival for local Michigan metal bands, the festival has also hosted bands that I had only dreamed of seeing at that point in my life, such as Mushroomhead, Dope, Hatebreed, Kittie, Bleeding Through, and Motograter. By the time I was finally old enough to attend, the event had not been held for a few years, and I could hardly find any information about the festival or whether it would be held again. 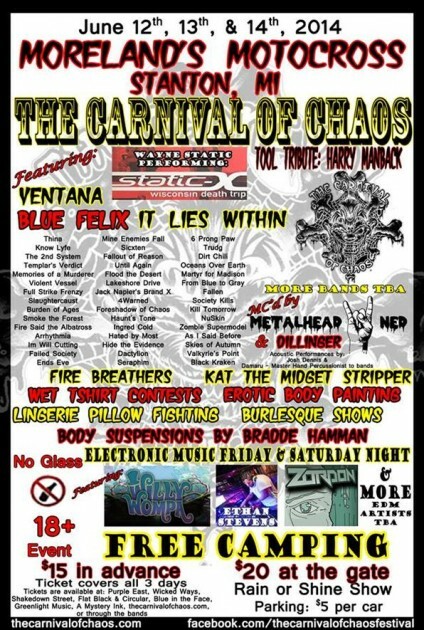 Now, just a few years later, The Carnival of Chaos is back, with a lineup featuring more than 70 local metal bands and 10 electronic music artists, with more to be announced in the coming months. There are also headliners like Blue Felix, the band I wrote an article about last month; Ventana, the side band of Stitch from Mushroomhead; and Wayne Static of Static-X, performing the entire “Wisconsin Death Trip” album. The event will be held at Moreland’s Motocross in Stanton (about 45 minutes from Mt. Pleasant) on June 12, 13 and 14. Camping is free all weekend, and the festival features other attractions such as fire breathing, tattooing, body piercing, and body suspension. Alcohol is permitted for those of age, as long as there are no glass bottles, and attendees may bring their own food and grills. Vendors will be on site, and attendees are also permitted to leave for food and return.